You are here: Home / Dating Tips / Am I Settling or is This the Best I Can Do? Am I Settling or is This the Best I Can Do? Can it be better? Closer? More connected? The short answer is is almost always YES. “How do you know if what you have is the best you can get? That you’re not settling? That you’re not just filling a role? Thanks for your question–and it’s a great one–whether you’re at the beginning of a relationship (as you are) or you’ve been together for many years. First… we think it’s great that you’re in a relationship with a person that you’re really comfortable with and one that’s healthy, happy and loving. And–your two follow-up questions–“How do I know if this will work?” and “Should I date around more?”–reveal a lot about your situation than you may not be aware of. As good as your relationship seems to be, you may be fearing that it may not be enough for you and you may want more some time in the future. What we have discovered both in working with people like you in our Breakthrough coaching practice, as well as what we have learned in our own relationship and life, is that we all have different wants, needs, interests. We all have different things that drive us and make us be the way we are. As we really tune in to your question, it seems that on an intuitive level, you already know that for you–you want something else in addition to “comfort” in an intimate relationship. It depends on how important that passionate spark is to you. 1. Thinking about what you do have, how important is having that passionate spark to you right now? 2. In your mind’s eye, transport the two of you to the future 5 or 10 years down the road. Now look at how happy you are if nothing changes. Remember to just let your “gut” respond right now, without censoring it. Now, read your answers to yourself and feel how those land inside you. What are the feelings that come up? As you’re sitting with what came up for you during this exercise, consider a few ideas about passionate spark. The typical couple starts off with a great deal of excitement and passion between them. As we’ve said many times, the problem is that “life gets in the way” and they allow that passion to fade away–and no one knows exactly where it goes. Passion can fade to nothing but it can also be re-ignited if that’s what both people want. And what if that “butterfly” passion was never there to begin with? It can be pretty difficult (but not impossible) to “manufacture” it–unless both people really want it to happen. They have to find ways to open to each other and look at each other differently. If this relationship is really important to you and you want to keep it–and you are open to creating a little more “zing” with him–open yourself to the idea that it just might be possible with him. Open you heart to him in a different way and start thinking of him in a little different way. When you feel passionate toward him, when he stirs anything inside you–let alone butterflies–nurture that feeling and don’t dismiss it as not being enough. Some people have trouble thinking of a healthy, loving relationship in the same sentence as passion–and their beliefs get in the way when they finally find a “good” relationship. If this is happening, start opening the door for the belief that you can have a healthy, loving relationship AND passion–all with the same man and see what happens. Of course with passion, there’s that unspoken element of chemistry and attraction that can’t be denied. We’re saying that if passion is important and you’re in a good relationship, start taking some action to ignite it. One way to look at it is that this relationship is working and is giving you what you need in the moment. 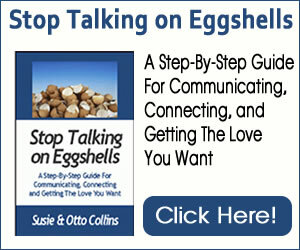 It’s teaching you what it feels like to be in a loving, healthy relationship that’s comfortable. Doesn’t have to be if you and your partner want more. We suggest you explore what you want and then open to the possibility of having it with this person before you go off to another one. We advise you to make conscious choices that will take you toward what you want in this moment and then in the next moment. The bottom line is that you might truly be noticing something that you feel will be missing from your relationship and your life if you don’t have it. You may be noticing where you need to put more of your attention in this relationship. Is Infidelity Good for a Relationship?